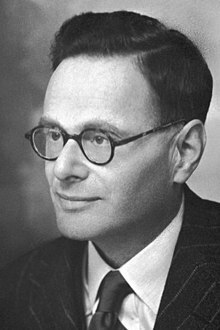 Sir Hans Adolf Krebs (25 August 1900 – 22 November 1981) wis a German-born Breetish physeecian an biochemist. He wis the pioneer scientist in study o cellular respiration, a biochemical process in leevin cells that extracts energy frae fuid an oxygen an maks it available tae drive the processes o life. He is best kent for his diskiveries o twa important sequences o chemical reactions that tak place in the cells o humans an mony ither organisms, namely the citric acid cycle an the urea cycle. ↑ Kornberg, H.; Williamson, D. H. (1984). "Hans Adolf Krebs. 25 August 1900 – 22 November 1981". Biographical Memoirs of Fellows of the Royal Society. 30: 350–385. doi:10.1098/rsbm.1984.0013. ↑ Weber, George (2001). "Sir Hans A. Krebs Centenary Lecture: cancer and clinical targeting". Advances in Enzyme Regulation. 41 (1): 1–29. doi:10.1016/S0065-2571(00)00026-1. PMID 11417529. ↑ Gibbons, Marion Stubbs, Geoff (2000). "Hans Adolf Krebs (1900–1981)...His Life and Times". IUBMB Life (International Union of Biochemistry and Molecular Biology: Life). 50 (3): 163–166. doi:10.1080/152165400300001462. ↑ Raju, Tonse NK (1999). "The Nobel Chronicles". The Lancet. 353 (9164): 1628. doi:10.1016/S0140-6736(05)75758-5. PMID 10334294. ↑ Kantha, S. Sri (1991). "The question of nepotism in the award of Nobel prizes: A critique of the view of Hans Krebs". Medical Hypotheses. 34 (1): 28–32. doi:10.1016/0306-9877(91)90061-3. PMID 2056924. ↑ "Sir Hans Adolf Krebs". Encyclopædia Britannica, Inc. Retrieved 26 July 2014. ↑ Leigh, F W (2009). "Sir Hans Adolf Krebs (1900–81), pioneer of modern medicine, architect of intermediary metabolism". Journal of Medical Biography. 17 (3): 149–154. doi:10.1258/jmb.2009.009032. PMID 19723965. ↑ Edsall, John T (1993). "Master of metabolic cycles". Nature. 366 (6454): 417–418. Bibcode:1993Natur.366..417E. doi:10.1038/366417a0. This page wis last eeditit on 5 Dizember 2018, at 22:54.